A Half Step is the distance between one note and the next-closest note, up or down. 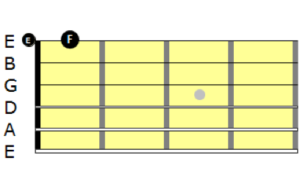 On the guitar, a half step can be played by sounding one pitch on any string and then another pitch either the fret above or below on the same string. As you can see in Ex 1, there is no note between these two pitches, as a half note is the smallest interval in Western music. A Whole Step is equivalent to two half steps. It is the distance between one pitch and another either two frets above or below the previous note. To find an interval, begin by counting the number of letter names that span from one pitch to another. Count the first pitch as “1”. Both whole and half steps span the distance of only two letter names, therefore they are both the interval of a second. The distance between one note and the very same note is called unison. From there we count second, third, forth, all the way to seventh. Once you have reached a note with the same letter name, that’s the interval of an octave. Two notes may either be played at the same time or one after the other. The terms harmonic and melodic are used to distinguish between the two. Both are measured the same way – by counting the letter names. Both of these intervals are a 4th apart. Now that we know the distance between letter names, we can be more specific. Remember that both A to Bb (a half step) and A to B (a whole step) are both considered seconds. This occurs with other intervals like A to C and A to C# (both are thirds). To be a little more specific, we should learn to express the quality of an interval. Compare the C major scale with the C minor scale. Perfect Intervals are the most consonant sounding intervals, meaning they sound the most agreeable or stable. Unisons and Octaves are the most perfect intervals, while perfect fourths (P4) and perfect fifths (P5) are the next. Notice how these intervals are the same for both major and minor. Major Intervals include the third, sixth, and seventh scale degrees that are found naturally within the major scale. These are labeled with an uppercase “M” (M3, M6, M7). 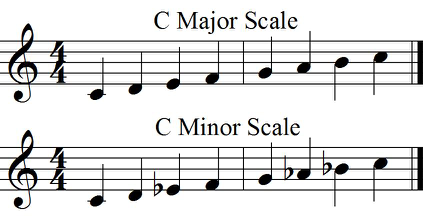 Minor Intervals include the third, sixth, and seventh scale degrees that are found naturally within the minor scale. These are labeled with an lowercase “m” (m3, m6, m7). The only outlier in this system of labeling intervals is the second scale degree. Notice that it’s a whole step away from the root note in both scales. A whole step is equivalent to a major second (M2), while a half step would be considered a minor second (m2). 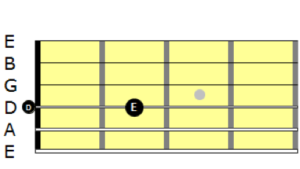 The only other note besides the m2 NOT used in either of these scales is the note between P4 and P5. This is a Tritone (also known as the Blue Note or Devil’s Note \m/). Both the m2 and the tritone are extremely dissonant intervals. Though counting half steps isn’t the easiest way to define interval names, this ordered chart can help put them all into perspective. Have any other questions? Comment or send us an email. Please share this post if you think others might find it interesting, and don’t forget to subscribe to our mailing list. Great lesson! I feel it belongs in the theory review of Traversing the Fretboard. Thank you, Andrea! I’m glad you found it helpful.